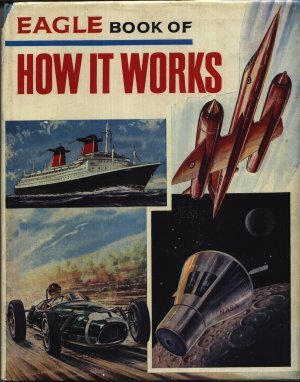 Eagle Book of How It Works states that it will answer some of the questions that are posed by the marvels of modern scientific technology. It then goes on to say: Today, more than ever before, a key to the understanding of scientific discovery is an everyday essential. Today's popular How It Works television series proves that nothing changes ! Learn that the first model helicopter flew over 227 years ago. Valves for radio and television were still the normal practice. The Electronic Brain describes a computer which is probably much less powerful then most modern mobile phones. Into The Future looks at Jodrell Bank - it's still there and in use today.